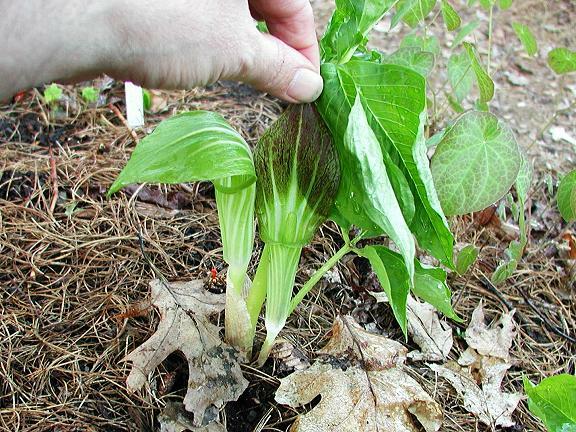 Arisaema species O-S are listed on this page. 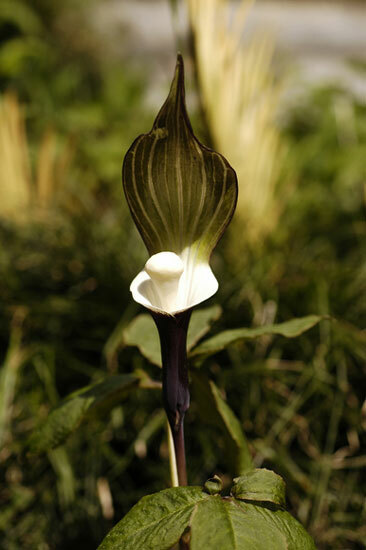 Arisaema omeiense is a small jewel from section Flagellarisaema 10 to 20 cm tall. 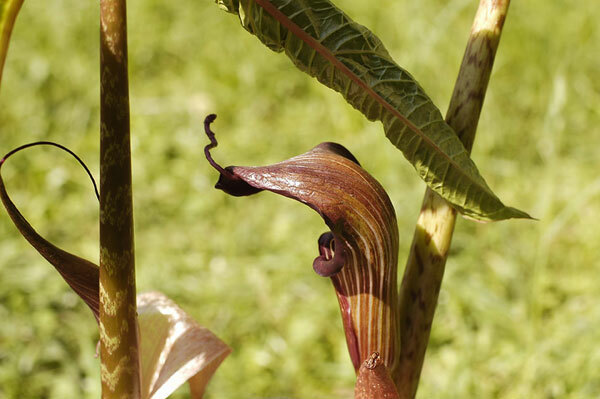 This species grows in W. China in rainy woods; the spathe has long auricles and the spadix is male or female with long appendage like a tail. 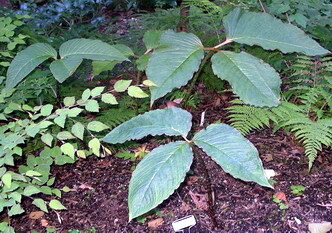 One of the first to blossom, this plant came from Chen nursery (China) as A.51 with the incorrect name of A. onoticum, a species which is much taller. 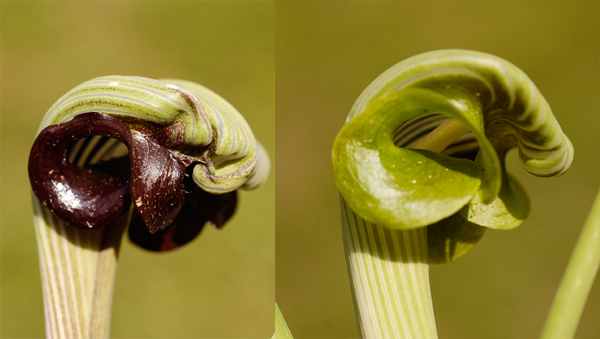 The first two photos were taken by Giorgio Pozzi, April 2006 and the second two in April 2007 showing more details of the flowers of this very small plant. 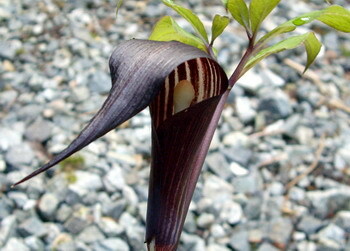 Arisaema propinquum is from the Himalayas. Photo taken by Giorgio Pozzi April 2006. 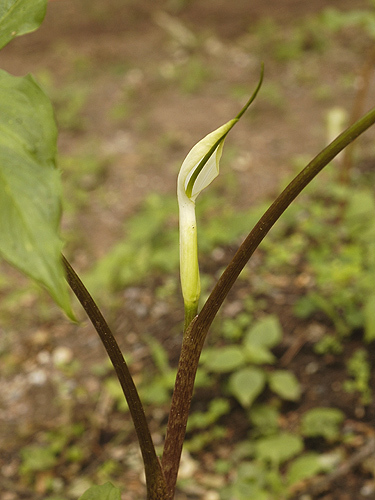 Arisaema rhizomatum is from northeast India and western China. Photos by John Lonsdale. 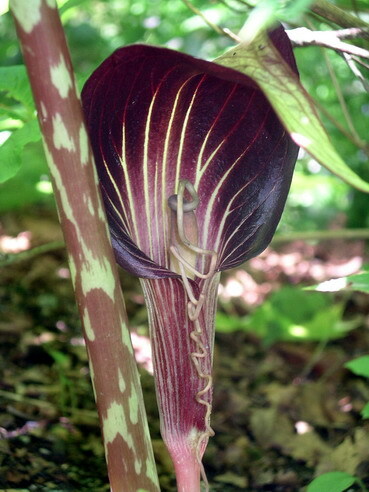 Arisaema ringens - a Korean form. 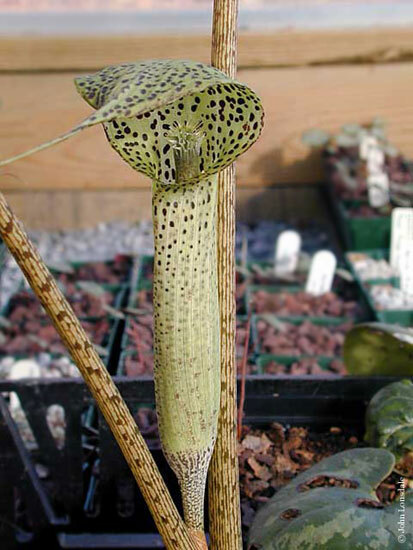 This is not my plant (drat) but one that I photographed at a local NARGS (North American Rock Garden Society) meeting, the plant grown by Roy Herold. 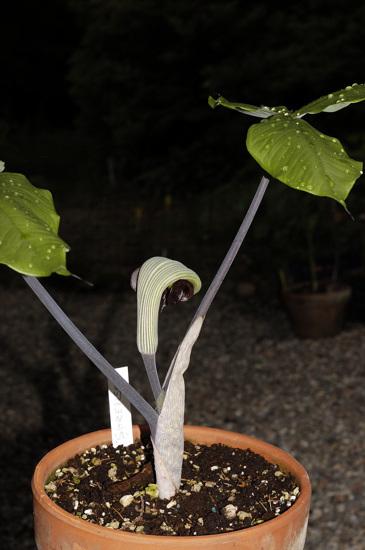 I've grown and lost A. ringens before, unique with its tight fist-like green spathe, but this form with the shiny black ring is striking. Notes and the first photo from by Mark McDonough. Photos 2-6 from Giorgio Pozzi. 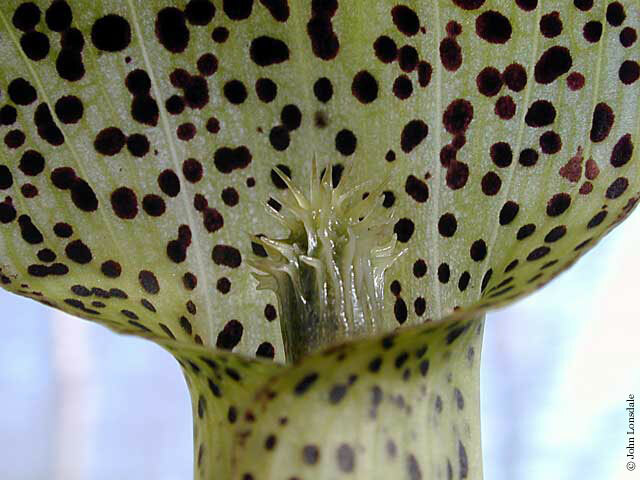 Photo 2 taken April 2006 shows two colors of spathe-margins. 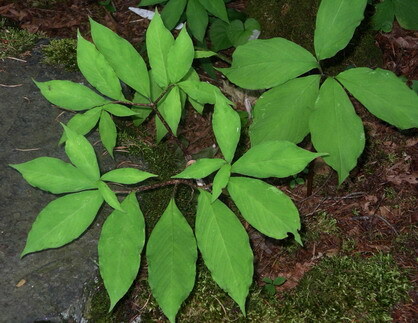 Photo 3 shows a plant unfolding its leaves in the woods and 4 a plant in full ground with green (spotted) peduncle and mouth margins. 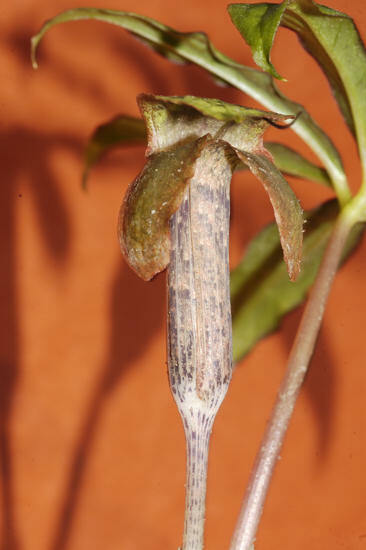 Photo 5 shows a young specimen with purple peduncle and petiole and dark purple mouth margins. Photos 3-5 taken April 2007. The last was taken Spring 2008. 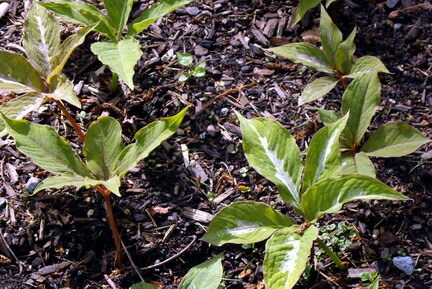 It shows a rich clump growing in the wood with different colours on stems and mouth borders; many new young plants are growing near mother tubers. 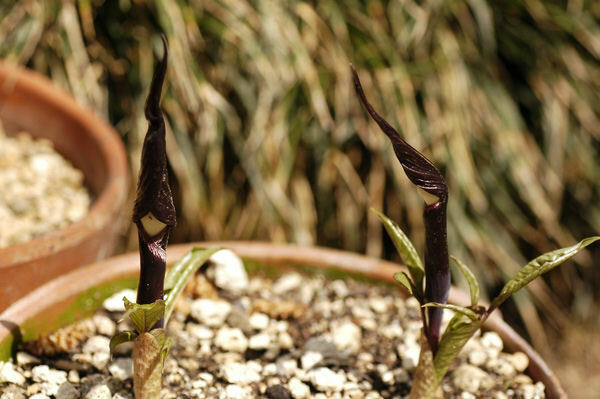 Arisaema sazensoo - native to the Kirishima hills of Kyushu, Japan. 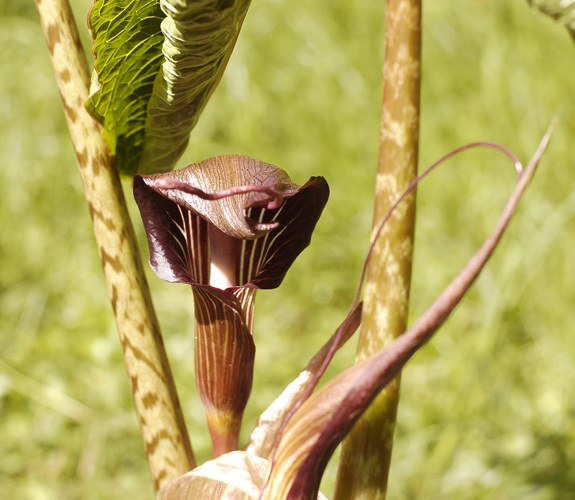 This is a striking species with a small white "pestle". 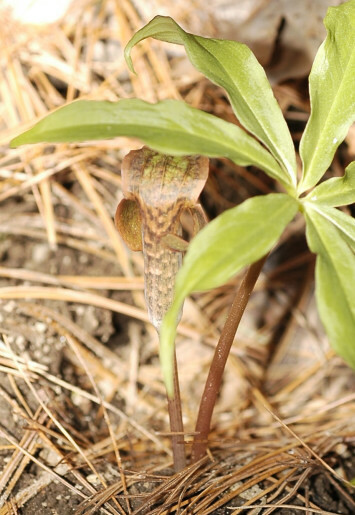 This species is quite varied and the stem may be red or green. 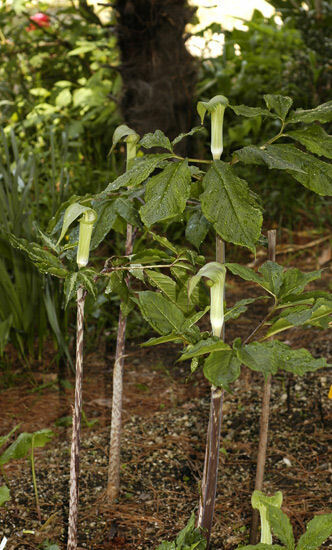 Grows to about 50 cm (20"). Hardy to 6, perhaps colder. 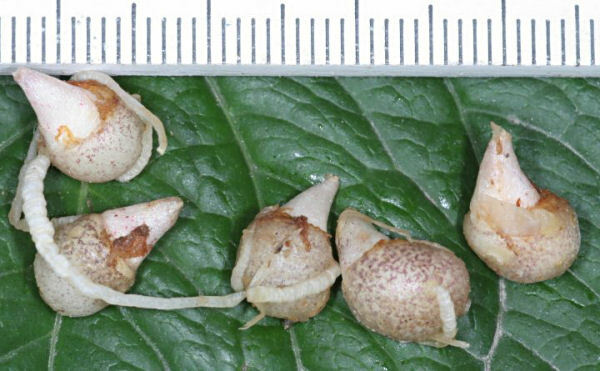 Possibly of Section Pistillata. Photos by Paige Woodward. 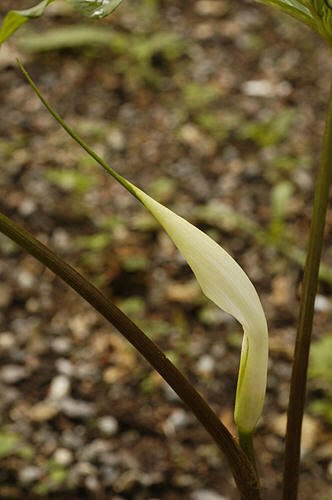 The first picture shows the splash of white down the leaves, a variation found in the siblings of Arisaema sazensoo. 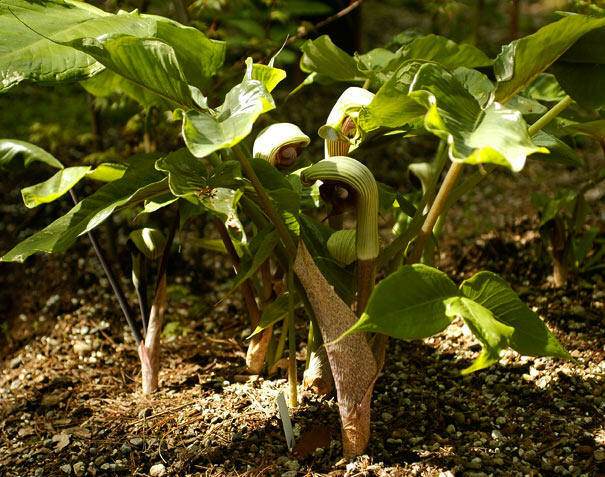 Arisaema saxatile is a medium size plant in section Tortuosa from Sichuan and Yunnan (W. China). 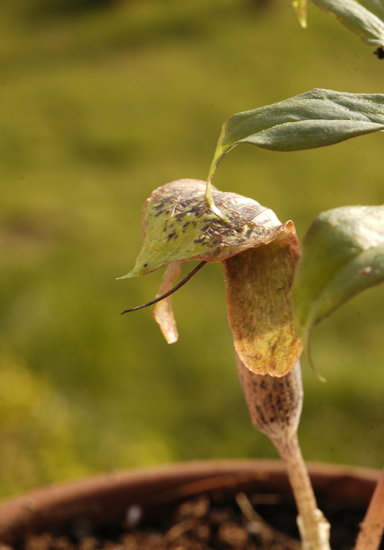 It likes dry conditions. 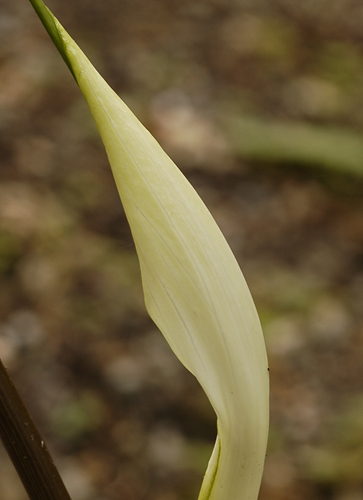 The spathe, at foliage level, turns to white while unfolding; the spadix turns from white to green with a long-exserted apex . Photos by Giorgio Pozzi, June 2006. 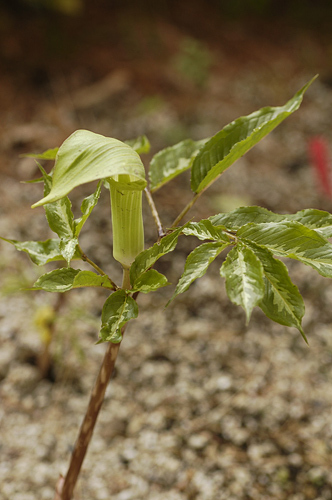 Arisaema serratum is over 50 cm tall, with some plants rising up to 150 cm. 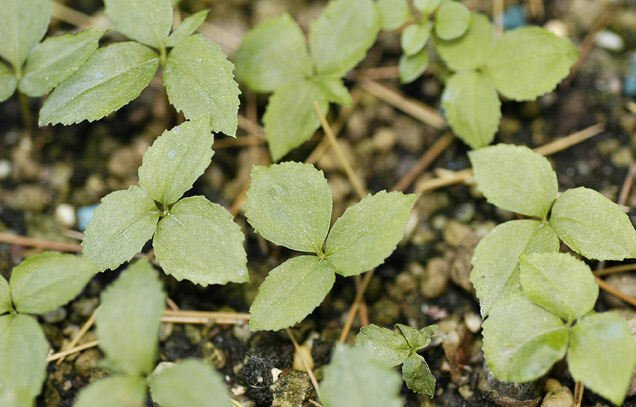 It has two pedate leaves, and is in section pedatisecta. 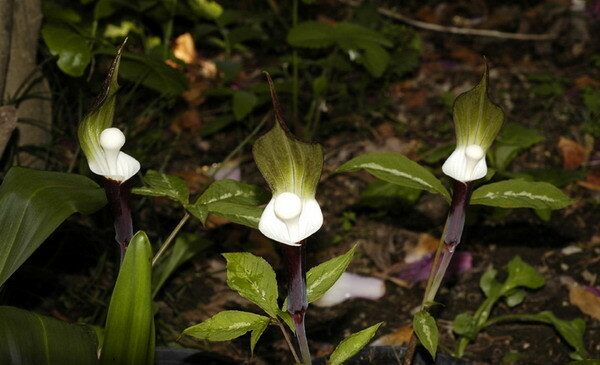 It is found in Japan, Korea and East/China. 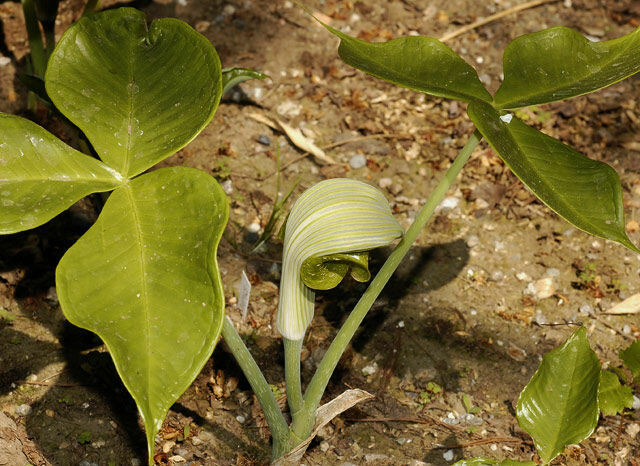 This species has either plain green or variegated leaves like the specimen in the first picture below taken by Giorgio Pozzi, April 2006. 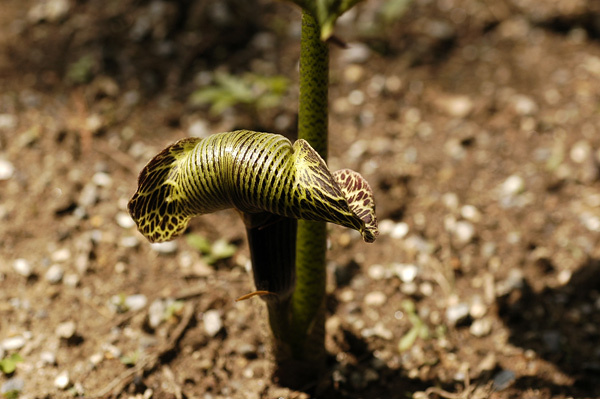 The second photo was taken by Giorgio Pozzi April 2007 who writes: "Here is a clump in the garden; these plants are 80/90 cm tall." Photos 3-5 were contributed by Paige Woodward. 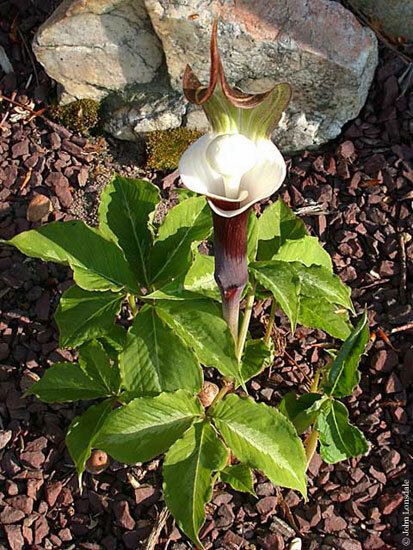 Arisaema sikokianum is a spectacular plant with a dark brown "pulpit" and a snow white, club-shaped "jack". 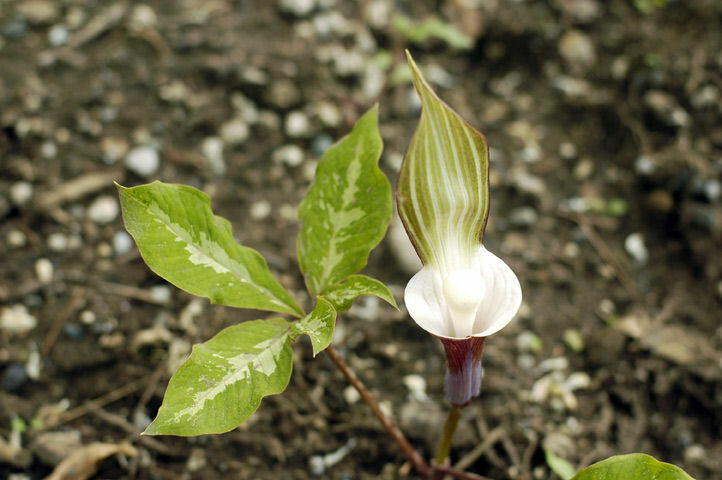 It is one of the early bloomers and is from Japan. The first photo by John Lonsdale. Photos 2-5 taken by Giorgio Pozzi, April 2006. 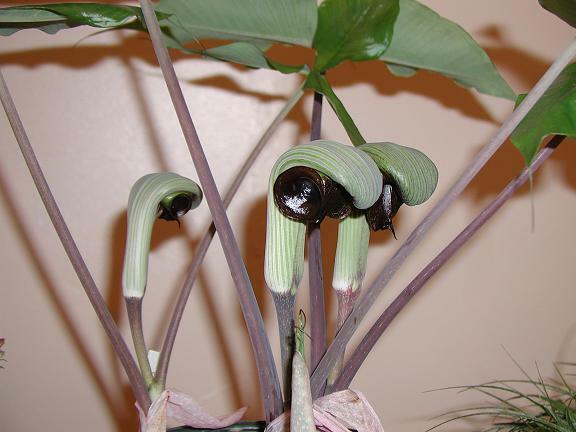 These show the flower, two young plants just flowering and unfolding leaves with the club-shaped spadix already visible, the silver-centered leafed variety from May 2006, and first year seedlings in cultivation (note the trifoliolate first leaf with serrated margins). 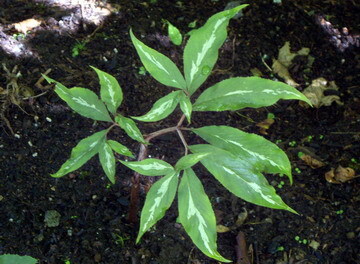 Three young plants with variegated leaves, " silver center leaves form "; the tubers are three years old April 2007. 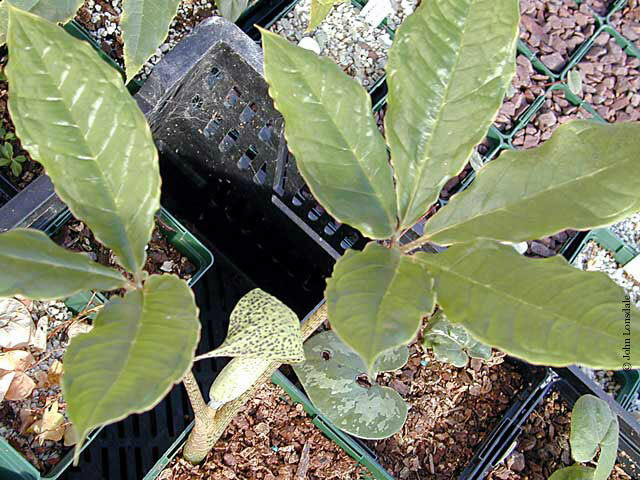 The second picture of a specimen with rich variegation on the leaves, May 2008 . Photo by Giorgio Pozzi. Photos by Giorgio Pozzi of tuberlets. 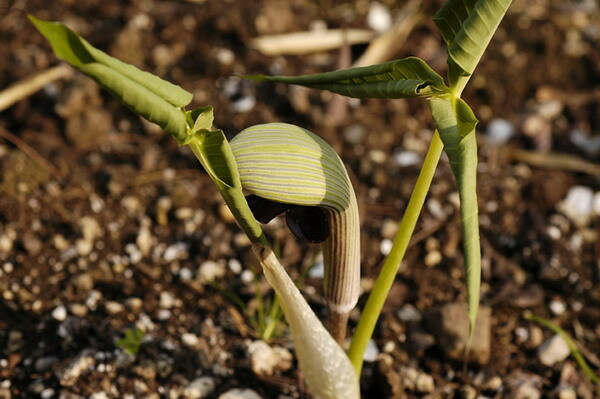 First is an unusual first tuberlet from seed, note the double tubercle, quite unusual in this species as these tubers aren't proliferous. The second photo shows first year plants dug in November with the usual one bud on a mm. scale. 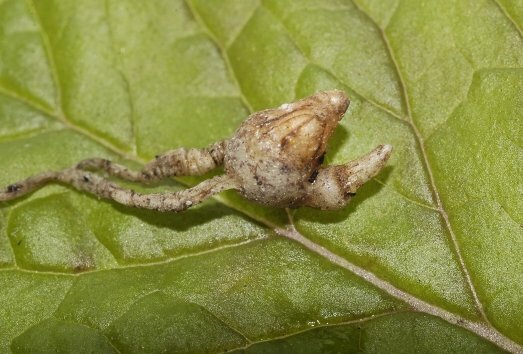 Final photo by David Pilling shows seed on a 10 mm grid. 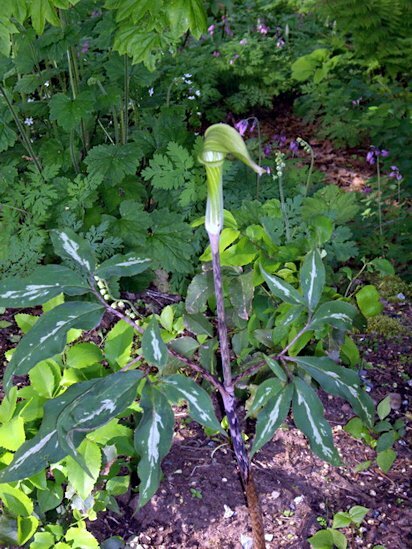 Arisaema speciosum is a very tall plant with a very big rhizomatous tuber, deep purple spathe and snake-skin patterned stem. 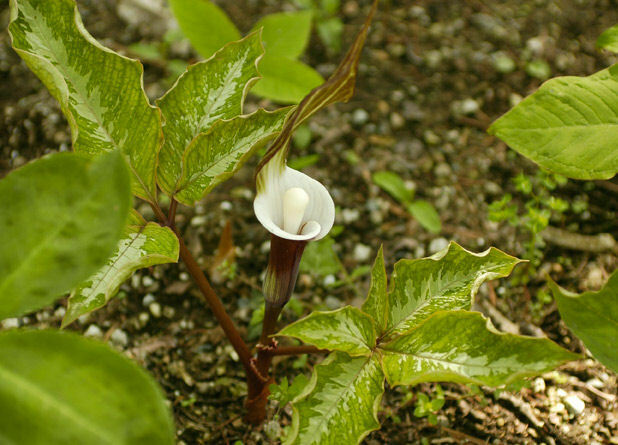 In his introduction to the topic of the week, Ernie O'Byrne describes it as: "A spectacular species with a trifoliolate leaf with red on the lower surface and an attractive flower with a long-threaded spadix appendage and purple and white stripes on the spathe. 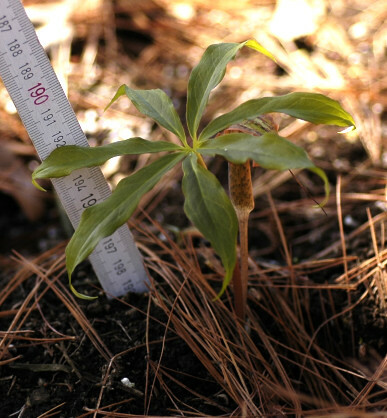 It has done very well for us in both pots and in the ground." Photos 1-2 were taken by Giorgio Pozzi May 2006. Photos 3-4 were contributed by Paige Woodward.